Endodontic procedures fix problems caused by tooth pup and the tissues that surround the teeth. At Clearbrook Dental Group, we can use root canals to fix these problems. 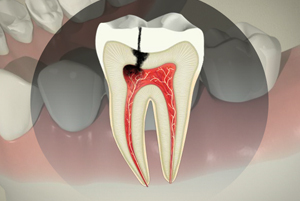 A root canal is a procedure that is needed when tissue inside of a tooth dies. This can be due to a cracked tooth, a deep cavity or a tooth injury. In having a root canal, patients can save their tooth from having to be removed at a later date when symptoms, such as pain and swelling develop into a larger problem. After numbing the area around the infected tooth, the dentist disinfects the tooth and has the dead tissue is removed. The tooth will be filled and fixed with a crown. If left untreated, pus can develop and extend to the jawbone and swelling increases, which not only causes more pain, but can destroy the bone around the tooth. Even though a tooth is rebuilt, a patient should still brush, floss and visit the dentist regularly to ensure their teeth stay healthy.